Old Haul Road is an out-and-back beginner-level fire-road ride deep in the redwood forests of Santa Cruz Mountains. There are other beginner fire-road rides available in the Bay Area, but most of those are along creek beds in urban areas, along the shores of reservoirs, by the bay shore, or generally close to populated areas. This one might be unique among such easy rides for its remoteness and a setting that might qualify as wilderness. The ride is especially ideal for beginner riders who have graduated from the completely flat or paved recreational trail rides and need something more like a "real trail ride" but without any true climbing. The road is within Pescadero Creek County Park. If I'm not mistaken, this was a logging road in its earlier life. Since that also means that this was originally a logging area, the trees you'll see along this trail are all second-growth redwoods. However, that doesn't change the fact that the forest through which this trail passes has a very dense and lush feel to it. The trail starts from the doorstep of Memorial County Park, from a trailhead on Wurr Road just off Pescadero Road. There's a small amount of roadside parking available right at the trailhead. If that's filled up, your backup option for parking (provided you arrive after that park's opening time) is to park in Memorial County Park right around the corner, though be aware that you'll have to pay a small fee for that. The trail has a few short "humps" of climbing soon after the beginning. These may feel unwelcome to a beginner rider, especially since they arrive very early on the ride, but they are really the only noticeable physical challenges that the ride presents. After that, as you can see from the elevation profile, the ride settles into a very even and very gentle (about 2% average grade) climb for about two miles. This is barely enough to feel like work on the way up, and barely enough to coast without pedaling on the way down. While there are other undulations from there to the end of the road, they're equally as gentle. Near the far end of the trail, shortly before the turn-around point, Portola Trail sets off to the left (northeast), toward the headquarters of Portola Redwoods State Park. 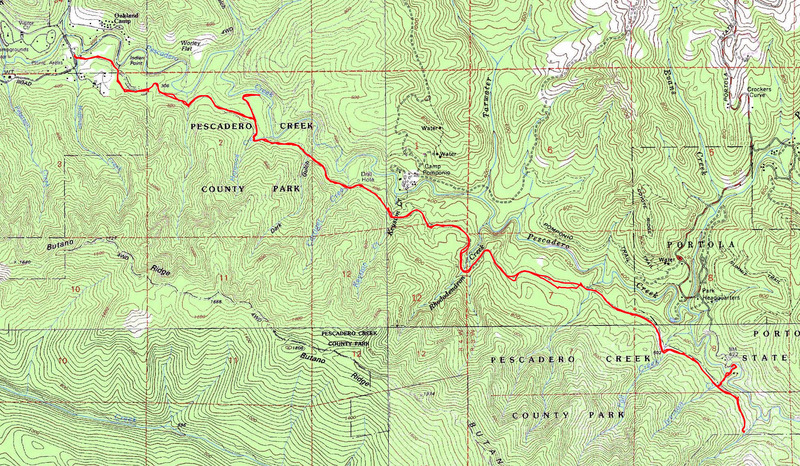 The ride route shown on this page includes a short spur into this trail up to the bridge that leads to that park. The only reason to do this short spur would be to see the Iverson Cabin site, where an early settler had his historic cabin. (Interestingly, it sounds like it used to stand until the Loma Prieta earthquake in 1989.) As of this writing, there's little more than a sign board and some pieces of lumber on the ground there. While this segment is short, it's quite steep over part of its length. So, if you are in fact doing this ride with beginner riders, let them know that they might have to walk some parts of it. One interesting note might be that the park map shows the presence of a county jail on the other side of Pescadero Creek from where the trail passes, somewhere near the midpoint of the road's length. While this might sound mildly intriguing, it doesn't contribute or detract anything from the ride, because you don't get to see anything. The forest is just too dense. In fact, there are a couple of nearby campgrounds also marked on the map just on the other side of the creek from this trail, but you don't even see the creek from the trail during the ride. This ride won't do anything for a seasoned mountain biker from a biking fun point of view. If you like nature, you'd enjoy the remote wilderness setting of the trail and the rich forest, though. And if you do have a beginner (or non-) mountain biker you'd like to show around, the experience of taking a bike ride several miles into the middle of nowhere in the heart of nature could be enjoyable for that person. That's about it. While there seem to be quite a few other trails and roads intersecting with this ride, there are unfortunately few (if any) reasonable loop or extension options for modifying this ride. All trails leading (south) up Butano Ridge are hiking-only. Toward the north, only paved roads in the adjoining Portola Redwoods State Park are legal for bikes. Taking Towne Fire Road or Bridge Trail north into the rest of Pescadero County Park is an option, but there are no bike-legal trail options that provide a loop opportunity there either; you still have to take to paved roads sooner or later to complete any loop. The closest thing to extending this ride by an additional loop mostly via trails would be to take Towne Fire Road to Ridge Fire Road, and then (still) to paved Pescadero Road to return to the trailhead. I've seen a couple of books that recommend taking Portola Trail into Portola Redwoods State Park and then riding over paved Portola State Park Road, Alpine Road, and Pescadero Road to make it into a (fairly long and mostly road-riding) loop, but keep in mind that most of those roads are fairly narrow public roads that are not exactly extra safe for bikers.